You find Partille Ställplats in the scenic area of Kåsjön, just outside Gothenburg (Göteborg). It’s a campground with 23 pitches, specially made for caravans and motorhomes up to 10 meters long. The car is parked alongside with the caravan and is not counted with in the total length of the equipage. There’s no space for an awning. 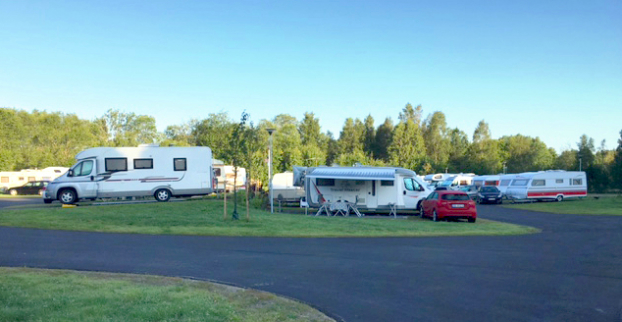 As a guest at Partille Ställplats you have WiFi free of charge throughout the campground, you can empty your waste tank, fill the on-board fresh water tank and you have a recycling station and other amenities such as shower and toilets. There’s a security bar at the entrance to prevent non-authorized vehicles to enter. The campground is surrounded by nature as well as lit up trails for running and walking. Five minutes away you have a nice spot for bathing. In the vicinity there are three sports halls, a riding house, Nya Partille Arena and the Allum Shopping Centre. A few minutes away you have the bus stop for number 513 that takes you to the centre of Göteborg and Liseberg without hassle. You’ll go to Landvetter Airport in 15 minutes by car from the campground. Longer stays can be booked by mail or telephone and at the reception at Partille Vandrarhem (the hostel next door). Self-service is available at the campground. You check in and can pay at the entrance via a vending machine around the clock.